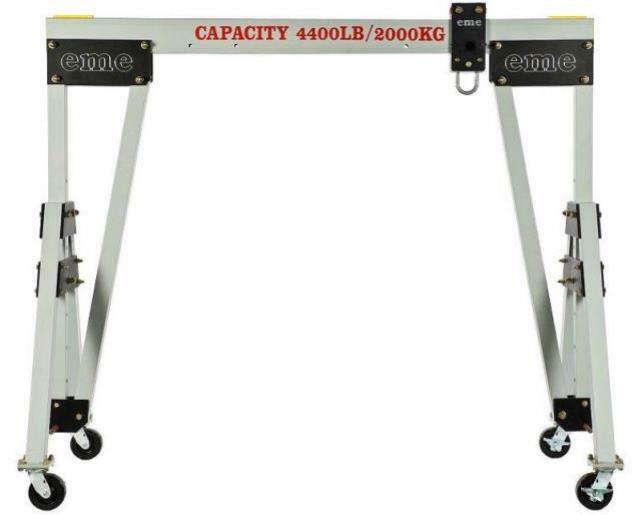 GANTRY CRANE - 8'2" - 11'6"
4400lb/2000kg capacity Gantry Crane available with 8'4", 10', or 15' beam, will straddle load and can lift a load up to 11'6" (clearance to lift ring) for portability. Corner support arm reduces beam span width by 17" at both ends. Footprint depth is 67" at wheels. Chain hoist or suitable winch available separately. Breaks down into 4 pieces for transport, transport weight is 355lb. * Please call us for any questions on our gantry crane 8 foot 2 inch 11 foot 6 inch rentals in Calgary, Alberta.